The waiting has come finally to an end. 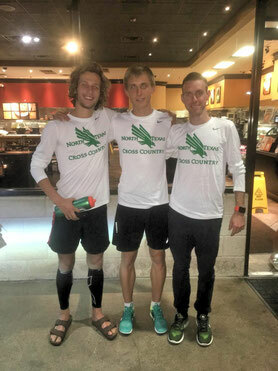 Last Thursday, I ran at the Baylor Bear Twilight Invitational my first Cross Country race in the USA. My first race in the US-Cross-Country-Season was more hectic than expected. Due to lightning danger the race was postponed several times. This made the race even more of a test of patience. But it was perfect practice for our nerves because the next races won't be anything like we planed. Because the light got dimmer the organisier decided to shorten the race form 6k to 4k. As a newcomer, my biggest stress factor was that we weren't allowed to warm-up on the course. I started the race without the really knowing where I had to run. Fortunately I have two fast teammates who already knew the course. As expected the race was fast from the start. Our team planned to dominate the field from the beginning but on the first mile there were a few other teams which tried to define the pace. As we turned into the narrow wood section our team had three runners in front. After several hundred meters we returned to the start area. At this point I felt really relaxed and tried to run in the optimal position so that the athletes from the other teams had to run a longer distance. Around 800m to go, Eric Anderson (Baylor) attacked but I was able to start a counterattack and took the lead. I finished first and won my first US-Cross-Country race. Straight behind me finished my teammate James Coleman in second position. North Texas won both team races against Baylor and Texas. The race was a test for our team to see how good we already work together. In comparison to the european races, in the US you have teammates in the race, which gave the issue "race tactic" another dimension. For myself it was very encouraging how comfortable I felt by running this fast pace although we hadn't run so fast in training yet. In addition it was fun to run in such a competitive race. The race is significantly smaller than the upcoming races nevertheless the first two kilometers were harder-fought than most races in Europe. Since I was looking for this competitive environment I am really looking forward to run the next races.